The Danville Area Transportation Study MPO leads in the development of the region's long-range transportation plan and short-range transportation improvement program through a partnership among the U.S. Department of Transportation and the Federal Highway Administration, Illinois DOT, local elected leadership, local planning and urban services employees, the business community, and citizens across the Danville region. The Danville Area Transportation Study MPO is committed to providing leadership to the region in the planning, funding, and development of a regional multi-modal transportation system; one that promotes personal and social economic prosperity while encouraging sustainable growth and development practices to protect and preserve valuable community and natural assets. The Danville Area Transportation Study is comprised of two committees, the Technical Committee and the Policy Committee. ​The DATS committees include representatives from: the City of Danville, the City of Georgetown, the Village of Tilton, the Village of Belgium, the Village of Westville, the Village of Catlin, Catlin Township, Danville Township, Newell Township, Georgetown Township, Vermilion County, Danville Mass Transit, CRIS, Vermilion Regional Airport, and the Illinois Department of Transportation. The Danville Area Transportation Study is guided with an annual Unified Annual Work Program (UPWP), a 4-year Transportation Improvement Program (TIP) and a 25-year Long Range Transportation Plan (LRTP). 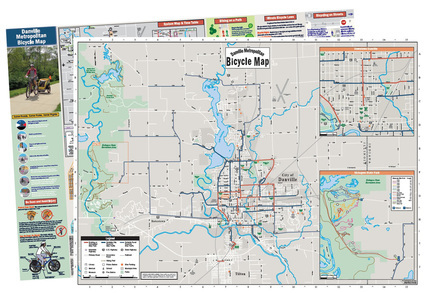 ​Click here to download the new Danville Metropolitan Bicycle Map.